Friends don’t let friends buy mattresses without taking advantage of a referral program. Before signing up with any mattress company, you should always take a look at what kind of referral program they have. A good referral program can earn you some serious rewards or cash back by signing up a friend. You should also reach out to people (make a Facebook post, Twitter, etc.) to see if there’s an opportunity for someone to be a referral for you, so that you both can reap the benefits of a great referral program. Brands know that word-of-mouth is one of the most valuable ways to get more people buying their product. A potential customer is only a good friend’s suggestion away. We’ve done the research on referral programs for mattress companies all over. Here’s what we found. Leesa is a state-of-the-art mattress that’s a major player in the mattress industry. Their business model is built on a the idea of a hassle-free process. They deliver mattresses straight to your door, eliminating the need for a physical shop for customers to enter. They’re also globally conscious. Leesa has donated 23,000 mattresses to charity since they started. 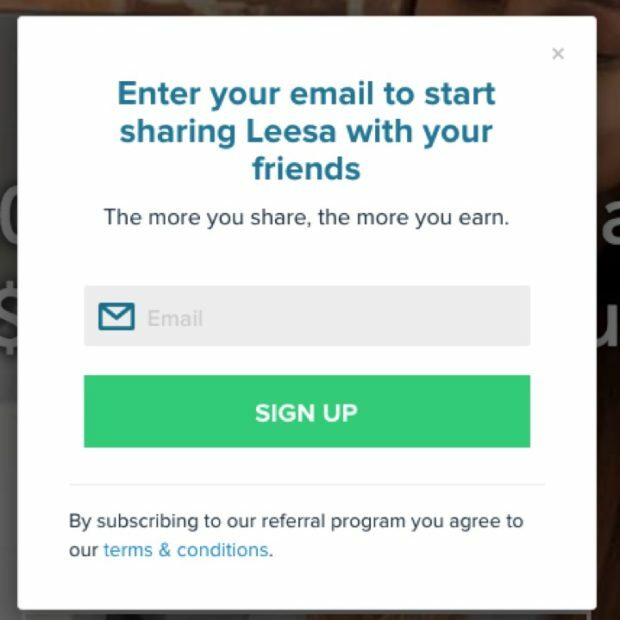 When you refer a friend to Leesa, your friend will get $100 off their order and you’ll get $50 cash. It pays to refer! Secret pro tip: If you have no one to refer you, but you still want to get a discount on Leesa Mattresses, there are some online coupon websites, like Dealspotr, that allow members to post their referral codes for others to use – even if they don’t know you! Perhaps the most “futuristic” mattress in the group, Eight Sleep is a high-tech bed that interacts with the sleepers. There is built-in bed warming, an alarm, and it works with Amazon Alexa. It’s a true smart bed. You can talk to Alexa like you would any other time. You can tell Alexa that your bed is cold and Alexa will warm it up for you. Amazing! 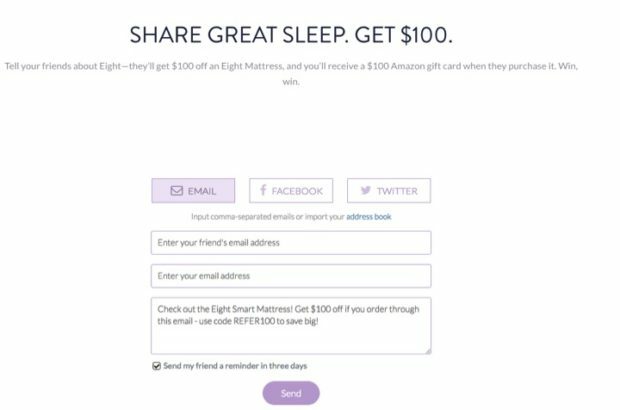 Eight Sleep offers referred friends $100 off their mattress and the person who referred them a $100 Amazon Gift Card. That’s a great deal! As one of the most popular mattress companies around right now, Casper Mattress is making a long-lasting impact on the mattress industry. Pioneering the mattress-to-your-door phenomenon, Casper mattress is a serious online mattress shopping contender. Their streamlined design is attractive to the younger generation who desires a more simple design than previous generations. Without using a lot of materials, Casper mattress makes sturdy and dependable mattresses along with the accessories. 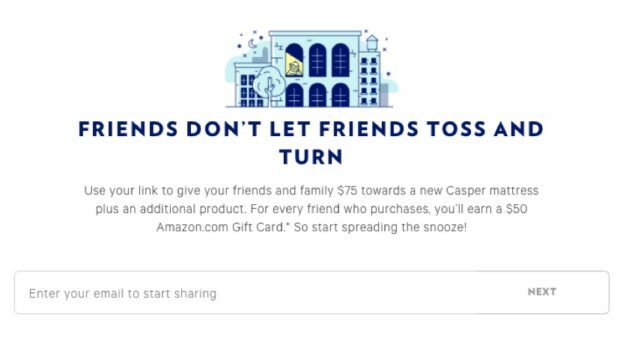 Described as “brand advocates,” current customers of Casper Mattress can refer a friend who will get $75 towards their new Casper mattress they purchase. They’ll also get an “additional product.” You as the brand advocate will get a $50 Amazon Gift Card. The process is simple. Enter your email in, enter your friend’s email, click to prove you’re not a robot, and then click on the big blue “Share Casper” button. 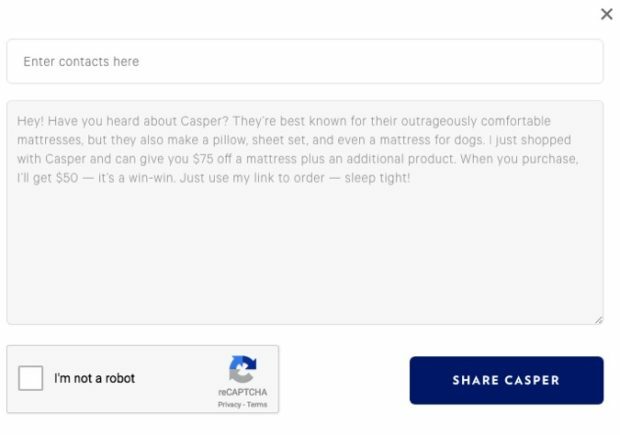 There are other ways to get discounts on Casper Mattresses, like searching Offers.com for promo codes, but their referral program is pretty outstanding! Another mattress company with a great referral program is Wink Beds. Wink Beds believes that a pushy salesman is not essential for customers to find a great mattress. Based in Wisconsin, Wink Beds uses American sourced materials and handmade in the U.S.A.
Wink Beds has a referral program that is straightforward. After you refer a friend who purchases a mattress, the friend you referred will get $50 off their purchase and you will get $50 straight cash. Another brand that’s gaining traction in the sleep industry is Helix Mattress. Their mattress are known for the personalized design. You actually fill out a “sleep quiz” so that the company can better create a mattress suited for you. Not everybody is the same, so this is very cool. The referral process is as follows. When your friend buys their mattress, they’ll receive $100 off their order and you get a $50 Amazon Gift Card! Once you click on “Invite Friends,” you’ll be taken to a window where you can refer friends. 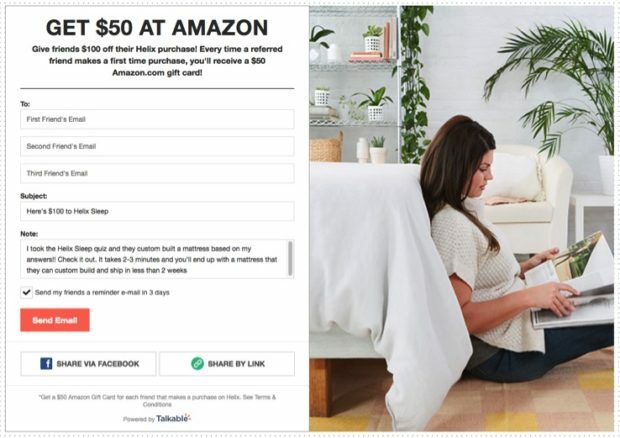 You can enter multiple friend’s emails and rack up those $50 Amazon Gift Cards. This next company prides themselves on using materials that use less petroleum than other brands. Amerisleep offers eco-friendly yet high-tech design. Amerisleep has beds that are firm yet comfortable, and won’t leave you sinking. The referral program is simple. Refer a friend who purchases a mattress and they’ll get $50 off that mattress and you’ll get a $75 Prepaid Visa Reward. There are no limits to how many $75 rewards you can earn, so keep referring your buddies! It might have a risque name, but the company is totally professional. The Naked Mattress offers an ergonomic edge to their mattress. Their mattresses come with a comfort top that comes in firm, medium, and soft, because they know not everyone is the same. What’s unique about The Naked Mattress is their use of a “cool gel” within their mattress. This cooling gel keeps you from getting too hot in the night because they know that no one likes overheating while trying to get a good night’s rest. See? They’re more than just a neat name. Refer a friend and you’ll get $50 while your friend will get $50 taken off their purchase. Your $50 will only be paid out after the 100 day trial is up for your friend. The Naked Mattresses services Vancouver, Calgary, Edmonton, London, Waterloo, Kitchener, Cambridge, Toronto/GTA, Ottawa/Gatineau, and Montreal, but the referral program won’t work unless you are a Canadian citizen. Until they expand, only Canadians will get to enjoy The Naked Mattresses referral program. We hope this list was a big help in finding which mattress works for you. It’s time to hit the sack feeling good that you not only helped a friend find a wonderful mattress company, but that you also got some extra cash in your pocket.